..... Click the link for more information. , class Magnoliopsida, order Ebenales, family Sapotaceae. Although this tree only grows in warm, tropical areas, I included it because the latex from this tree is the original source of chewing gum and the Sapodilla fruit is super sweet tasting like malty caramel dipped in brown sugar. These trees are popular in warm areas from Mexico to India, tropical Asia, Philippines, Caribbean, and people are starting to grow them in southern Florida, California, Hawaii and greenhouses. It can grow to 100 feet tall (30m). Wind-resistant. Bark is rich in a white, gummy latex called "chicle", containing 15% rubber and 38% resin, which makes it a great base for chewing gum. Tree has glossy elliptical leaves, little white bell-like flowers, with a six-lobed corolla. Fruit is large elliptical berry resembling a smooth potato containing two to ten black seeds that have a hook on one end. Don’t swallow the seeds whole or they will hook into your throat. Fruit inner flesh is yellow to golden brown with grainy pear-like texture. Fruit has a high latex content and does not ripen until picked, whereupon the fruit softens to a firmness and appearance very similar to that of a fuzzy, brown-skinned kiwi. Unripe fruit are high in tannins which dry out the mouth (very astringent) and contain high levels of saponin. Tree bears fruit twice a year. Young leafy shoots can be eaten raw. Fruits, leaves, flowers and bark used for diarrhea, coughs, colds, pulmonary issues, Crushed seeds are a diuretic claimed to expel bladder and kidney stones. A fluid extract of the crushed seeds is sedative. Seed paste is applied on stings and bites from venomous animals. The latex is used in the tropics as a crude filling for tooth cavities. (Manilkara achras, Manilkara zapota, or Achras zapota), a plant of the family Sapotaceae. 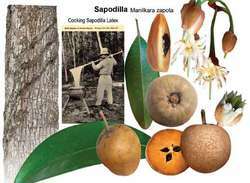 An evergreen tree measuring 15–20 m tall, the sapodilla has ovate or elliptic leathery leaves and small, white flowers. The rounded or oval fruits, which measure 5–10 cm across, contain ten to 12 hard black seeds and have sweet and juicy yellow-brown flesh. The sapodilla grows in tropical rain forests of Central and South America; it is cultivated in all tropical countries as a fruit and industrial plant. The milky juice obtained from the bark contains 20–25 percent of a substance closely related to gutta-percha, which is used to manufacture chewing gum. Meanwhile Ciku gives me one more nasty look then walks out, shutting the door behind her. Ciku has been really focused on her goals and has been saving money to fund her future business. The government told (the aid groups) a month ago that the situation would be bad, but they haven't done a thing," Mr Ciku said.